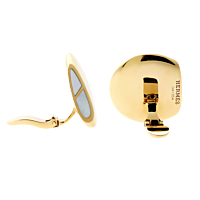 These gold mother of pearl clip on earrings from Hermes earrings define understated elegance. Easily worn everyday, the smooth, 18kt yellow gold spherical studs feature inlaid mother of pearl, adorned with a link motif and a clip on closure. The Hermes mother of pearl earrings measure .86" wide by .94" in length.